Ai Weiwei has been silenced for the present, making this an important book for understanding China and the intersection of politics, dissent and art. It is hard to understand any nation from the outside, and almost as difficult to reach understanding from the inside. 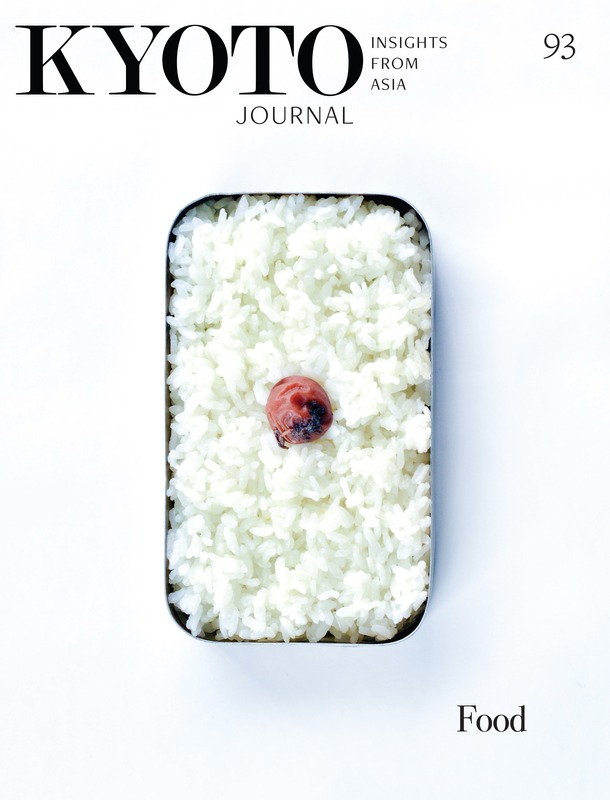 Expatriates play an important role in interpreting the country they come from (think Americans in 1920s Paris) and the country where they live (Kyoto Journal itself is an example). Artists play a similar role, never being completely comfortable within their own culture. 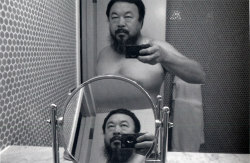 Ai Weiwei has been an expatriate; he lived in the US from 1981 to 1993. And he is a serious artist, a Marcel Duchamp for China, or perhaps an Andy Warhol, but with a more explicit political edge. The son of the celebrated and persecuted poet Ai Qing (a book of Ai Qing’s selected poems has been translated and published by Foreign Languages Press), he has always lived in an environment where politics and art are interlaced. Ai Weiwei has been exhibiting in the US since the early 1980s and after his return to China in 1993 he became active in the East Village scene on the eastern outskirts of Beijing. In the 1990s he edited and published the iconic Grey Cover Book, Black Cover Book and White Cover Book documenting the lives and works of East Village artists. Thus began a long series of works that are based on documentation while questioning it. Ai Weiwei’s career has blossomed over the past 20 years and he has become a fixture on the international art scene, representing China at events such as Documenta 12 in Kassel, Germany where he presented Fairytale (an installation and performance piece in which he had 1,001 Chinese people from all walks of life come and live in Kassel). He has also had major installations at museums such as the Tate Modern (where his Sunflower Seeds project opened in October 2010). Ai has complemented his art and documentation work with a minor career as an architect, designing restaurants, studios and houses in China and most famously consulting on the Herzog & de Meuron design for the Bird’s Nest Stadium for the 2008 Beijing Olympics. An investigation of architecture informs many of his art projects. Ai Weiwei began blogging on sina.com in 2006 and it quickly became an obsession. He would spend hours each day adding posts and interacting with readers. This book is a sampling of the blog, which had more than 2,700 entries over the three-and-a-half years it was active, and has only a small fraction of the photos the blog was known for. A sampling, but for a Western audience a suggestive one, and as the blog and most of its content are banned in China this is the best selection currently available. After the Chinese government shut down his blog in 2009 Ai switched to Twitter, and found that the concise microblogging form suited the Chinese language and his immediate needs. Of course this has also been silenced. The blog followed an arc of increasing political engagement and anger. 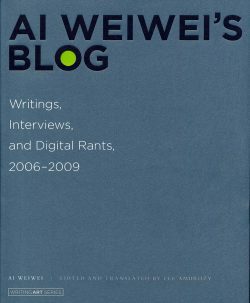 In 2006 most, or at least most of the posts selected, are on art or on Ai Weiwei’s experience of living in Beijing. “Quietly Settling Dust” posted April 26, 2006 captures the experience of living in Beijing during a dust storm and at the same time makes a political point by recalling the SARS crisis of 2002 and linking the dust in the air to an opaqueness in personal and political discourse. The book really begins to find its form with the Wenchuan earthquake of May 12, 2008. Ai immediately went to visit the site of the disaster and document the tragedy, and in March 2009 he began a Citizen Investigation of the actual number of deaths caused by the earthquake and shoddy construction practices (“tofu-dregs construction”). In his 2010 solo show at the Haus der Kunst in Munich Ai Weiwei wrote out “She lived happily in the world for seven years” on the face of a building using the kind of backpacks that the school children killed in Wenchuan would have been wearing. The quote comes from a mother whose daughter died in the earthquake. This book can serve as a primer on many of the incidents that troubled China in the first decade of this century. SARS, Sanlu Milk Powder, Yang Jia and his mother Wang Qingmei, AIDS in Henan, the role of CCTV … these memes frame conversations inside China and Ai Weiwei has sharp things to say about each of them. The footnotes by editor and translator Lee Ambrozy are exceptionally clear and useful – after finishing the book I read through the footnotes from start to finish to remind myself of all I had learned. Looking at other reviews of this book, there is a lot of chatter as to whether Ai Weiwei is really an artist or not (see as an example comments on Jonathon Fenby’s Guardian Review of June 5, 2011). If you are the type of person who is sure that you know what art is then Ai Weiwei is probably not for you. He asks too many questions and is too ready to question himself. An honest response to his work will likely include disgust, boredom, huh! & huh? as well as curiosity, amazement and the occasional descent into beauty. This book is must reading for anyone engaged in contemporary art or concerned with the fate of China. It gives the insider/outsider perspective we need, or at least one angle into the conversation.